Billion Dollar Gran is a wonderful and innovative online video slot game from Microgaming that has been released in August 2009. This online video slot game has 3 reels and 1 pay line. The theme of Billion Dollar Gran is based upon a kindly (and fashionable) granny who can offer you lots of rewards slots-style, you just have to spend some quality time with her (afternoon teatime and knitting for starters) by playing this game! Probably one of the most specially-made slots games which resembles a pub slot more than a video slot game, Billion Dollar Gran is a very enjoyable slot game to play at, most especially when they have included Nudge and Hold features, which sets this one apart from other 3-reel classic slots. Most Microgaming online slot games are available in 2 formats. The first format is the one preferred by most players, which is the download format. The second format is the Flash or browser-based version, which means there is no need to download anything at all. Whether you like to download or not, Microgaming has slot games for all your slot gaming needs. Billion Dollar Gran is available for instant play only, so you no longer have to download anything. Do try playing Billion Dollar Gran right now because a lot of people who are into classic online slots games admit that this one is a simple yet very lucrative and enjoyable fruit machine! In the Billion Dollar Gran online slots game, you will get to meet Granny, an obviously rich elderly lady who enjoys knitting with her pampered white cat. Aside from her usual pastime, she regularly invites online slot players to have some tea and cake with her, and if the players get lucky, they will be rewarded great prizes! Because Granny is very generous by heart, she offers players cool and awesome features in the Billion Dollar Gran online slot game such as the Hold Feature, Nudge Feature, Shifta Feature, Let’em Spin Feature, WinSpins (Free Spins) Feature, a Nudge Gamble Feature, the Bowling Green Bonus Feature game (wherein you can win up to a 2,000x bet multiplier), and the maximum cash jackpot you can win is $20,000! The quality of the graphics and sound provided by Microgaming software is without doubt excellent. They possess an impeccable track record of generating the most spectacular graphics and realistic sound effects. A lot of online slot players love Microgaming because its online slot games have smooth animation and remarkable yet non-intrusive background music and sound effects. The slot game looks a lot like a typical pub slot game than a video slot game, but most players don’t mind much whatever it is, because for them it truly is a very exciting slot game for something that has only 3 reels and 1 pay line! The background of the reels show Billion Dollar Gran as the typical elderly lady sitting on her “throne” who knits furiously at the left side of the reels, with the right side showcasing her porcelain teacups, battenburg cake and other symbols that best describes her as a granny enjoying the best out of life. The background reel color is a deep purple, which is actually a color that symbolizes wealth and royalty. Billion Dollar Gran has been designed to have an authentic casino ambience with matching sound effects, which makes you more convinced that you are in a real casino playing an old-school slots game. The overall graphic design of Billion Dollar Gran displays main colors such as purple, red and pink. Other colors used include yellow, gold, green, blue, brown, white and black. Billion Dollar Gran does not have too much sound effects. When you spin the reels, you will hear the familiar sounds of a traditional slot machine game in land-based casinos. When you get nudges or winning combinations, jazzy and groovy music will be played. There are no regular card deck symbols available in the Billion Dollar Gran online video slot game. The regular symbols that you will find in the Billion Dollar Gran slot game are the Gran Head, Jewelry Box, Battenberg, Tea, Knitting, Sevens and Cherry symbols. There is no Scatter Symbol in the Billion Dollar Gran online slot game. In the Billion Dollar Gran online slot game, it has a Nudge Gamble Feature wherein you can gamble your current nudges in order to win additional nudges. You can win up to 4 extra nudges. Once the Nudge Gamble Feature game is over, you are then automatically taken back to the main Billion Dollar Gran online slot game. What sets Billion Dollar Gran apart from other 3-reel, 1-pay line slot machine games is that it has great features and bonus feature games! It has 8 cool features (Hold, Nudge, Nudge Bank Held, Nudge Repeat, Nudge Gamble Feature Shifta, Let’em Spin, WinSpins) and 1 fun Bonus Feature game (Bowling Green). The Hold Feature in the Billion Dollar Gran online slot game occurs randomly and its function is to hold the position of 1 or more reels for the next spin. When the Hold Feature is active, you will see the “Hold” buttons displayed just beneath each of the 3 reels. The Nudge Feature in the Billion Dollar Gran online slot game occurs randomly and its function is to allow you to bump a reel to display the next symbol. You can win up to 4 nudges per spin. The Nudge Bank Held Feature in the Billion Dollar Gran online slot game occurs randomly and its function is to bank your awarded reel nudges. You can win up to 4 reel nudges each spin. The amount of nudges rewarded to you is highlighted, and the Nudge buttons are enabled. To use your banked nudges, simply click the Spin button and the Nudge Bank Held will light up, showing you your collected nudges that will be available for that spin. The number of nudges available is highlighted and the Nudge buttons become active. Click on the Nudge buttons to bump the reels and move the symbols downward one at a time. Depending on the reel combination being displayed and the number of nudges you’ve got, you can create winning symbol combinations! The Nudge Repeat Feature in the Billion Dollar Gran online slot game occurs randomly and its function is that you can win the same amount of nudges used in your last spin. Please see the Gamble Feature section. The Shifta Feature in the Billion Dollar Gran online slot game is rewarded randomly after a spin that has no winning combination. One reel will be held and the other two reels will be nudged down automatically, until a winning combination will be formed on the pay line. The Let’em Spin Feature in the Billion Dollar Gran online slot game is rewarded randomly. If 2 matching symbols appear on the pay line after you have used up all of your awarded nudges, the Let’em Spin Feature will activate randomly. Do not “Hold” any of the reels, and click Spin. The reels will spin and you will be rewarded a random winning combination! 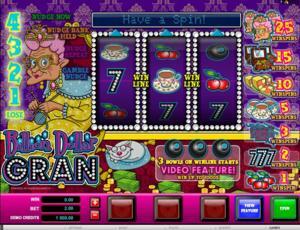 You can activate the WinSpins whenever you form winning combinations in the main Billion Dollar Grans slot game. WinSpins are considered to be the Free Spins on this particular slot game. Keep in mind that there are no cash payouts when you form winning combinations in the main Billion Dollar Gran online slot game, only WinSpins. You can win up to 25 WinSpins in the main Billion Dollar Gran online slot game. The WinSpins are played out automatically on the WinSpins reels wherein you can win up to a whopping 500x bet multiplier while in the WinSpins game! When the WinSpins feature game is over, you are then taken back to the main Billion Dollar Gran online slot game, and your winnings from the WinSpins are included to your total balance. If you manage to get 3 Bowling Ball symbols to appear on the win line, you will activate the Bowling Green Bonus Feature game. Please take note that there are no rewards paid out for the 3 Bowling Ball symbols combination. In the Bowling Green Bonus Feature game, there will be a bowling green and 4 bowling balls presented to you. Select the bowling ball that you think will be rolled closest to the jack by Granny. When Granny has rolled all 4 bowling balls, their final locations are ranked according to their distance from the jack. The closer the ball is to the jack, then the higher the multiplier value you will win. You are rewarded a multiplier value on your total wager amount, but that depends on the rank of your selected bowling ball. You are paid out winnings from the Bowling Green Bonus Feature game according to the Bowling Green payout (see the payout table). You can win up to a massive 2,000x (times) your wager amount in the Bowling Green Bonus Feature game! Once the Bowling Green Bonus Feature game is over, you are returned back to the main Billion Dollar Gran online slot game, and your winnings from the bonus feature game are included to your total balance. Billion Dollar Gran has 3 reels where you may bet on 1 pay line only. The minimum bet is 0.10 and the maximum bet is 10.00 per line. The maximum amount you can bet is 10.00 per spin. Please take note that the amounts mentioned above are in Pounds, but they will remain the same if you choose to play in US dollars, Euros, or Canadian dollars. The maximum payout in the regular Billion Dollar Gran online slot game is 2,000x the value of your bet multiplier. The game play at the Billion Dollar Gran online slot game is simple, fun and already fast-paced, so there is no need to incorporate an Autoplay function in this particular game.